Rocky Mountain National Park left us feeling breathless. Not because of the scenery, which is stunning, but because of the altitude. For a couple of east-coasters whose home state averages an elevation of 246 feet above sea level, the heights of the park required some adjustment. Even a week in the “mile high city” didn’t acclimatize us enough for the Rockies’ 8,000 foot valleys and 14,000 foot peaks. Our drive to the park took us through some of the most unbelievable scenery of our trip; winding through narrow granite canyons so tall they rose completely out of view. So mesmerized were we by the landscape that we barely noticed the relentless climb or the resulting lightheadedness that indicates altitude sickness. It wasn’t until after we stopped for a while that it really hit us. Short of breath, slightly dizzy and a little nauseous; we decided to take it a bit easy the first afternoon. Rest and plenty of fluids, together with abstinence from caffeine and alcohol, is the recommended response. Not only did that throw into question all the hiking we had planned, but pretty much everything we had planned. The Rockies were threatening to turn us into a bunch of lounge-about teetotalers. Completely unacceptable. 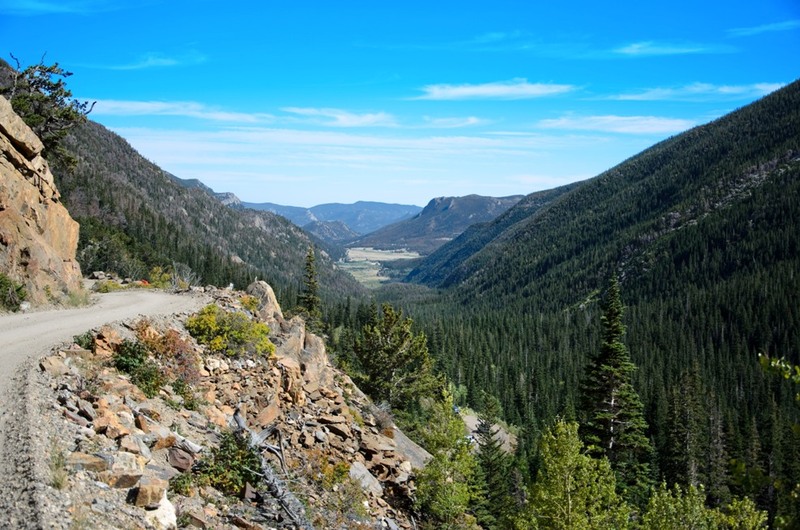 Fortunately, Rocky Mountain National Park boasts miles of scenic roads to explore. Although the wisdom of driving twisting, mountainous roads and skirting hairpin precipices all while slightly dizzy is open to debate, we decided driving was a better option than hiking; and a far better option than sitting in our rockers sipping water. So in the car we piled and off we went. 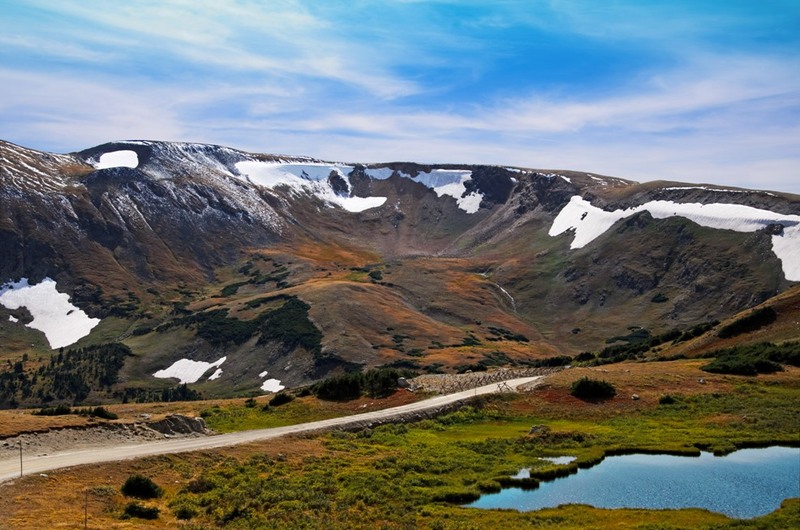 Trail Ridge Road is said to be the highest continuous highway in the U.S. It connects the city of Estes Park on the eastern side of the Rockies with Grand Lake in the west. 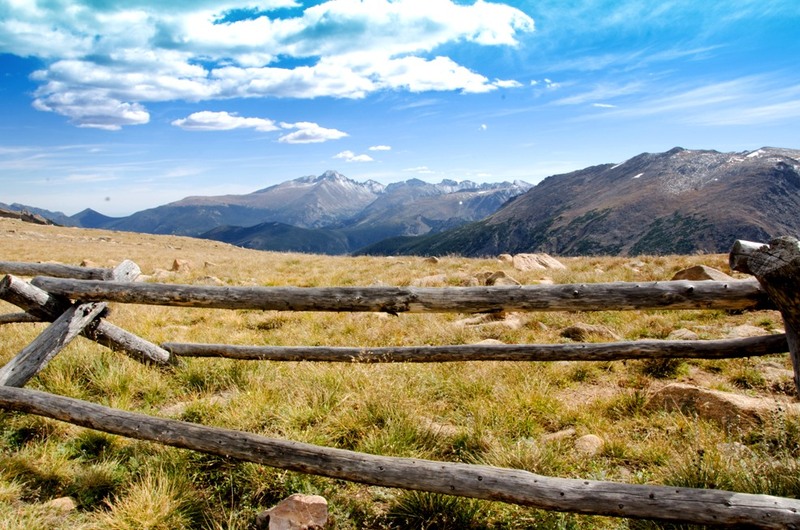 Along the way, it passes the Continental Divide and reaches an altitude of 12,183 feet. 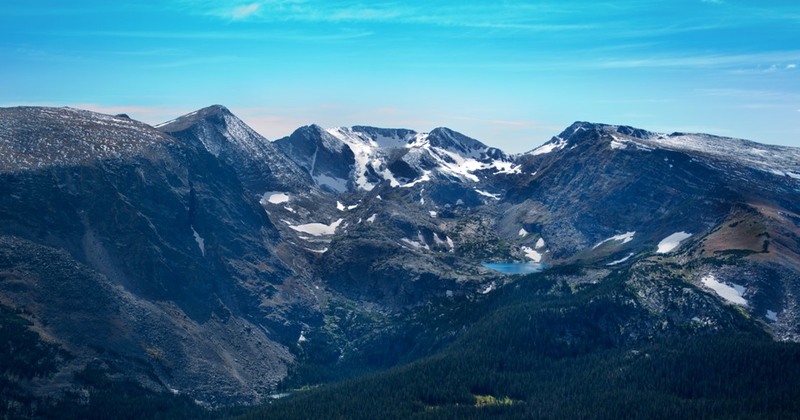 The mountain vistas along Trail Ridge are harsh and rugged; everything you expect when you think of the Colorado Rockies. Old Fall River Road climbs almost to the same height as Trail Ridge, but does so via an unpaved road. Due to the steep grades some early automobiles had to climb Old Fall River in reverse because of their weak engines and gravity-fed fuel systems. This single-lane dirt road made us glad we opted for a Jeep rather than the Honda Fit we were once considering. Along Fall River the mountains appeared older and weathered like the ones back east, only more dramatic. We got a completely different impression from the Rockies along this route. By the time we returned we had mostly adjusted to the altitude. The thin air still made strenuous activity more difficult than usual, but our chances for getting some hiking in started looking better and better. That called for a celebratory drink! Sitting in bed with flu, seeing those gorgeous pictures and reading your description, I felt the fresh air of your trip was doing me good too! Didn’t realise the Rockies were high enough to precipitate altitude sickness though (please forgive this English girl’s ignorance!) Thank you! I don’t think the Rockies are high enough to cause full-blow, delusional, walking off cliffs, style altitude sickness that someone climbing Everest might experience. But you sure feel the altitude change, or at least we did. You do have to take it a bit slow, and you can’t do as much as you’re used to, but there’s nothing wrong with slowing down a bit. Maybe it’s a blessing. Oh, you brought back memories! We hiked at Rocky Mountain National Park to prepare for a Swiss trip — and I can tell you that it’s much easier to hike in Switzerland! The altitude really got to me at Rocky Mountain. I live at sea level, and staying in Estes Park alone caused me discomfort. Still, we had some gorgeous hikes and have many fond memories of that trip. Lovely pics! We, too, stayed in Estes Park and I agree, it took some getting used to. The area is well worth the effort, though. It’s probably tough at 12 to take it easy and let yourself acclimatize. We found that the worst of the symptoms passed within a couple of hours. But if we were running around like a 12 year old, we probably never would have recovered. Along with the Grand Canyon, RM National Park is the most beautiful place in the country, in my book–certainly the most interesting and scenic drive. I went back this year for some light hiking–and a lot of driving on the scenic highway (better options at my slightly advancing age than any heavy hiking in that altitude that zapped you)–and to escape the inferno that Texas was back in the summer. It was my third trip to Estes Park, but it had been a good 25 years since my last visit, and it was just as breathtaking as I remembered it. It’s a great place. Have you stopped at Great Sand Dunes National Park on your way up to Rocky Mountain NP from Texas? That place blew us away too. Loved this post. You’re story is so exciting with all the things you get to see and experience and the photos.. wow. The nature is so so beautiful! Thanks for your very kind comments. It’s been several years since we’ve been to Sweden. It really is a beautiful country. I’m looking forward to getting back and spending more time there. I backpacked in Glacier National Park in my mid-20’s and had no altitude adjustment problems. Then went to Rocky Mtn Park in my 50’s without the backpacking, and noticed the altitude difference. But in either case, the beauty is inspiring. I am speechless how beautiful it is!!! I’d love to visit this place! Wonderful pictures!!! There certainly are plenty of great towns/cities in their vicinity. We really like the area. I am a little surprised by the lack of snow in that area being it’s December. In the early 90’s I spent a winter living outside of Breckenridge and it was snowing the say I moved in, October 1. Today’s post proved to me why I need a toad. Getting to that area in an RV and not being able to ‘dig’ deeper by traveling that gravel road would really disappoint me. Just caught your blog the other day and trying to catch up on your story. Since I am in the research phase of my RVing plan, what kind of RV do you travel and live in? Hello, I nominated you for the Versatile Blogger Award. Here are the details: http://wp.me/p1Qr4a-7I. Thank you for sharing your travels! Super photos, my wife and have traveled these same one lane roads. This park can leave one speechless!! !